It’s been awhile since I’ve found myself in the garden. 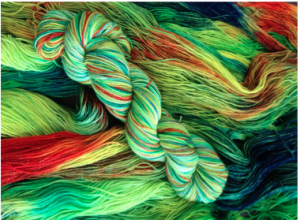 Throughout the year I bounce back and forth between knitting, spinning, dyeing, baking, and gardening. Some years the garden is planned with seeds purchased well before the last frost. Garden zones are drawn out and timing is written down just in case I get side-tracked by one of the many projects that keep me occupied. 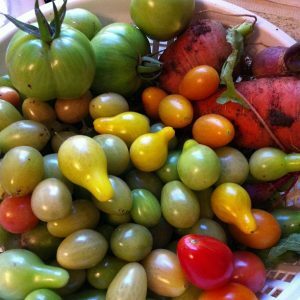 The years our garden is planned, I’ve been able to plant at least three times throughout the season and harvest vegetables well into the cold Maryland January. Some years I’m reminded by the weeds trying to overtake the garden, that if I don’t take action, they will. Zucchini and Cucumber are quick to grow during the intensely humid summer. 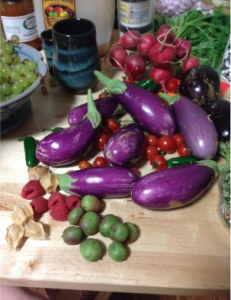 There are years I visit the local Farmer’s Market for fresh veggies and some years I’ve been lucky enough to receive gifts of tomatoes and eggplants from fellow knitters. I am often inspired by nature as I move to the dye pot. 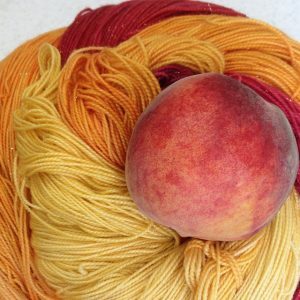 My first experience with dyeing took me out of doors. Hunting down side streets and looking to abandoned lots to collect flowers, walnuts, poke berries and acorns for dyeing, the butterflies and blooms would catch my eye and inspire me to create new colorways. When my mind is on dyeing and color, everything inspires. I can’t wait to share some of the simplest things that have helped me to create new and exciting colorways.